Retired business owner, Lynn Kirwan, wanted to make a difference by volunteering her time and 'give back'. She chose the Salvation Army Veterans Family Center as the organization where she volunteers and as Lynn puts it, "What better place to work than the Salvation Army Veterans & Family Center, helping our homeless veterans". Lynn is in charge of the Center's Annual Veterans Cruise In which was started 3 years ago when a potential volunteer mentioned his passion for vintage cars and music. The idea to hold a car show/BBQ fundraiser was born and it has "soared", to say the least. The 4th Annual Veterans Cruise In is scheduled for July 11, 2015, at the Valley Catholic School in Beaverton, Oregon. As of last year, the Veterans Cruise In, became the largest car show that supports local veterans. In the first 3 years, the event raised a total of $67,000 and ALL of the money goes directly to the VFC to assist their residents. A handicapped ramp to the back yard has been completed and a handicapped room is in the process. A children's fund will be established this year for backpacks, school supplies, etc., for the kids. The VFC, located at 14825 S.W. 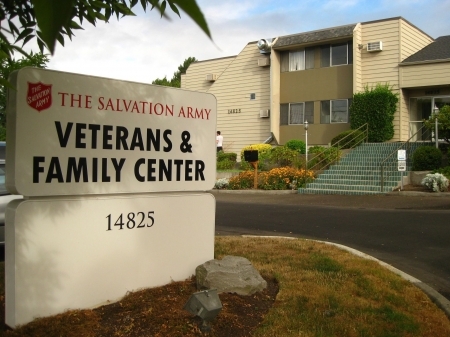 Farmington Road in Beaverton, Oregon, is the only program of its kind that assists homeless veterans and their families for up to 9 months. "We give them a chance to get off the street and settle down", says the VFC director. "We hope to help more veterans find work and permanent housing each year". By registering your vehicle for this family-friendly cruise in, you will be helping veterans and their families at The Salvation Army Veterans and Family Center get back on their feet. This transitional housing center for homeless veterans and their families provides case management, security, hope, and more for over 68 veterans and their families daily. 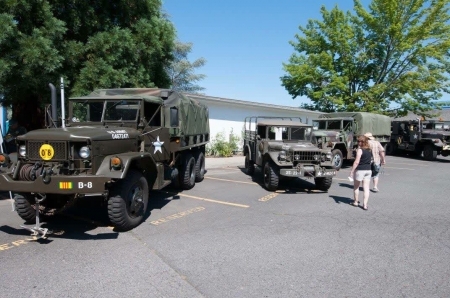 Over 250 show vehicles, Military vehicles, Swat car and Police & Fire vehicles will be on display. You'll also enjoy vendors, raffles, a Blue Grass Band and kids activities! FREE spectator admission for the whole family! Lynn says that many of the classic cars are owned by veterans, bringing the fundraising effort full circle! This year, after the Opening Ceremony at 10 a.m., there will be a Color Guard Performance, followed by a Korean War Veterans Honor & Salute. If you have the chance to meet Lynn, I hope you'll take a moment to thank her and her group of 40+ volunteers who have built this show from the ground up, and for so generously giving her time to help others. Thank you, Lynn! We Salute You!